For the first time in more than a quarter-century, a new space vehicle stands ready in NASA Kennedy Space Center's 52-story Vehicle Assembly Building in Florida. The final segments of the Ares I-X rocket, including the simulated crew module and launch abort system, were stacked on Aug. 13 on a mobile launcher platform, completing the 327-foot launch vehicle and providing the first entire look of Ares I-X's distinctive shape. The Ares I-X flight test is targeted for Oct. 31. A faultypart in the steering system for NASA?s new Ares I-X rocket has delayed thebooster?s trek to its Florida launch pad by at least a day as engineers work tofix the glitch. The rocket,a suborbital version of NASA?s newAres I booster designed to launch astronauts into orbit and ultimately backto the moon, was slated to roll out to Launch Pad 39B at the Kennedy SpaceCenter Monday for a planned Oct. 27 test launch. 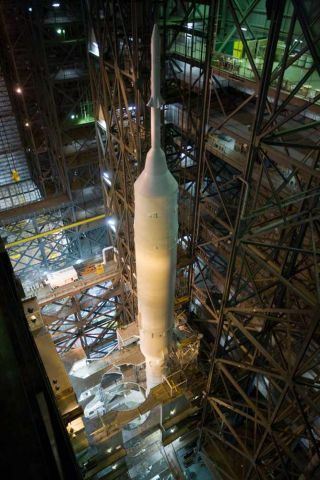 But a malfunctioninghydraulics component at the base of the towering, 327-foot (100-meter) tallrocket has stalled that plan, NASA spokesperson George Diller told SPACE.com. ?It?s atleast a day [of delay], but it?s still kind of a developing story,? Dillersaid. ?We?ll have to see how things go for us.? It is notyet clear if the glitch could threaten the AresI-X launch date, which NASA moved up from an Oct. 31 target earlier thismonth since work crews were ahead of schedule. Engineers are expected toreplace the faulty component, called a hydraulic accumulator, on the aft skirtof the Ares I-X rocket?s first stage and test its replacement over the next dayor so, Diller said. ?It?sassociated with the steering and stabilization of the rocket during flight,?Diller said of the faulty hardware. A similar glitch occurred on one of thesolid rocket boosters for NASA?s STS-117 shuttle mission in 2007 and alsorequired repairs, he added. NASA?s AresI-X rocket is a demonstration version of the full, two-stage Ares I booster,which NASA plans to use to launchits Orion spacecraft ? a capsule-based vehicle slated to replace the agency?saging space shuttle fleet. NASA?s three space shuttles ? Discovery, Atlantisand Endeavour ? are due to retire once the International Space Station iscompleted in the next year or so. The Ares I usesa giant, five-segmentsolid rocket booster for its first stage that is similar to thefour-segment versions used to help launch NASA shuttles. It is built to bereusable and parachute back to Earth to be recovered in the Atlantic Oceanafter liftoff. The second stage is liquid-fueled and not reusable and isdesigned to ferry its Orion capsule to orbit. For theAres I-X launch, NASA will fly a four-segment first stage that includes a dummyfifth segment. The booster?s second stage, Orion capsule and launch abortsystem are all mock-ups and will be dumped into the ocean after stageseparation just over two minutes into the flight. Mission managers have saidthe flight will demonstrate the Ares I rocket concept and shakedown groundpreparations procedures. Currently,NASA only has two days ? Oct. 27 and Oct. 28 ? and try to launch the Ares I-Xmission before standing down due to the unavailability of the Eastern Range itshares for launches with the nearby Cape Canaveral Air Force Station and UnitedStates military. Diller saidthat it may be possible to delay the Ares I-X rocket?s rollout to Pad 39B byone day and still make the Oct. 27 target. But any more delays could proveproblematic. ?Butit?s still too early to tell,? Diller said. SPACE.comwill provide full coverage of NASA?s Ares I-X test flight with Managing EditorTariq Malik and Staff Writer Clara Moskowitz. Click here for full mission coverage.